This article originally appeared in the March 2018 issue of Power & Motoryacht magazine. 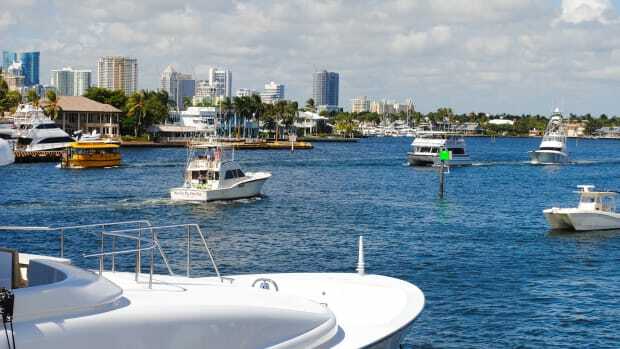 If you are interested in collision avoidance, the Navigational Rules, and understanding the "right-of-way" or stand on/give way interactions, make sure to check out our Boaters University course, Fundamentals of Seamanship: Navigational Rules. Sign up today and use the coupon code: PMMBLOG for 20% off. 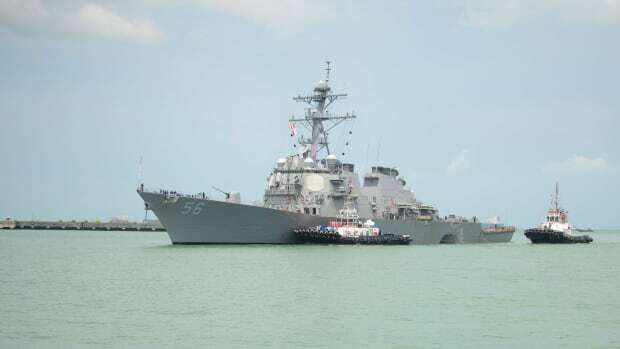 In 2017, at 5 o’clock in the morning on the 21st of August, the Arleigh Burke-class guided-missile destroyer USS John S. McCain was approaching Singapore’s easternmost traffic separation scheme, just east of the Malacca Strait. She’d just overtaken a slightly larger, Liberian-flagged tanker M/V Alnic MC, leaving her well astern on her port quarter. There were numerous watchstanders on the bridge. The weather was apparently exceptional. Speed, according to a comprehensive U.S. Navy review of the tragedy that would soon ensue, was 20 knots. 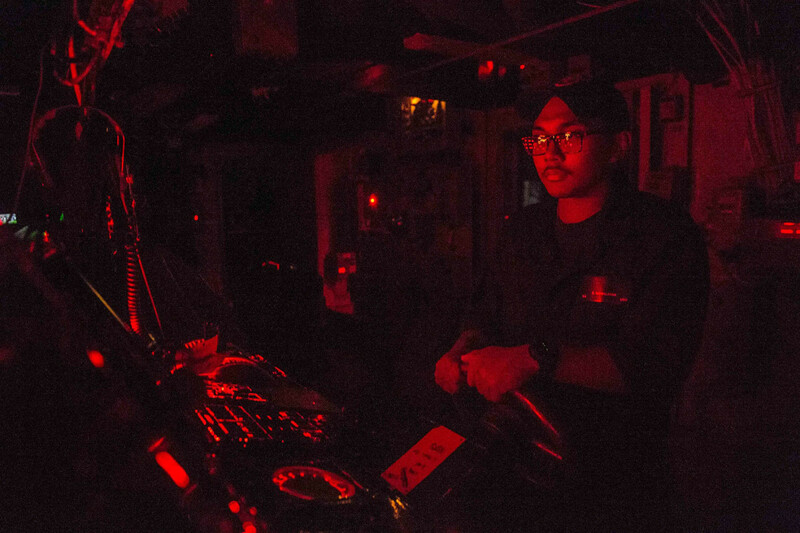 A Naval Seaman mans the helm on the bridge at night. There were, however, some issues that seemed minor at the time. First, three of the watchstanders were on temporary duty from another ship that was under repair, the USS Antietam, which some months before had suffered propeller and other damages while attempting to anchor in Tokyo Bay. Although the three were officially listed as qualified to stand watch on the ship, none of them had enough training to do so. Mostly, they were on board to gain underway time while the Antietam was in drydock. Second, the McCain’s conning officer—a pivotal individual in terms of day-to-day navigation—was a freshly minted ensign who was also relatively new to the ship and had not attended the Navy’s Basic Division Officer Course, which mixes simulator training with instruction in navigation, seamanship, shiphandling, engineering, and damage control. 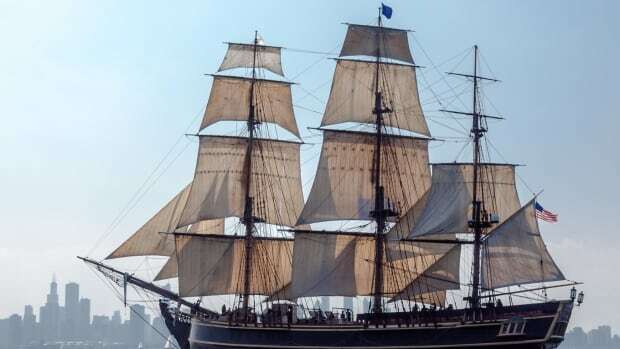 And third, against the advice of his junior officers, the skipper of the McCain had put off turning out the ship’s so-called “Sea and Anchor Detail” in order to give its members some much-needed rest. That decision would unfortunately leave individuals with considerable knowledge of steering-related technologies in their racks—and not on the bridge—at what would prove to be a critical time. Upon entering the separation scheme, the captain observed that the helmsman was having trouble steering while simultaneously governing the ship’s speed via her two throttles. In spite of the inadvisability of making significant changes to a standard propulsion configuration while hemmed in by heavy traffic, the captain ordered that the steering and throttle controls be temporarily split between the helm station and a nearby secondary station, the point presumably being to simplify the helmsman’s job. 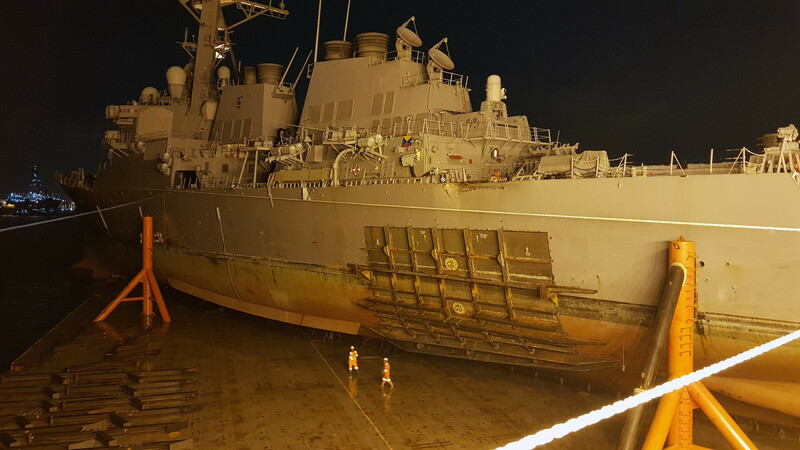 The USS John S. McCain’s port quarter was seriously damaged, both above and below the waterline. What happened next was deadly. An inexperienced watchstander on the bridge unintentionally transferred steering control from the McCain’s helm to the secondary station and, at the same time, inadvertently “un-ganged” or desynchronized the throttles in such a way as to retain starboard propulsion control at the helm but send port propulsion control to the secondary station. “I’ve lost steering,” the helmsman almost immediately declared, in the midst of the mild, good-humored chaos that typically arises when, as meal times approach, reliefs for meals are traded. Over the next two minutes, in a misguided attempt to rectify a problematic situation that was beginning to snowball, steering was transferred to a variety of remote steering stations around the ship a total of four times without the helmsman ever regaining steering control. Undoubtedly, confusion reigned. With a steering casualty seemingly on his hands, the captain ordered a reduction in speed and the young conning officer specified 10 knots. The crewmember at the secondary station quickly pulled both throttles back, unaware that his action was affecting only port propulsion. Starboard propulsion continued to churn out turns for 20 knots. The USS John S. McCain was carefully loaded aboard a heavy-lift transport for transfer to a repair facility in Japan. The unbalanced thrust imparted to the ship took effect quickly. The McCain slowed a bit, but then almost immediately began making a slow turn to port. 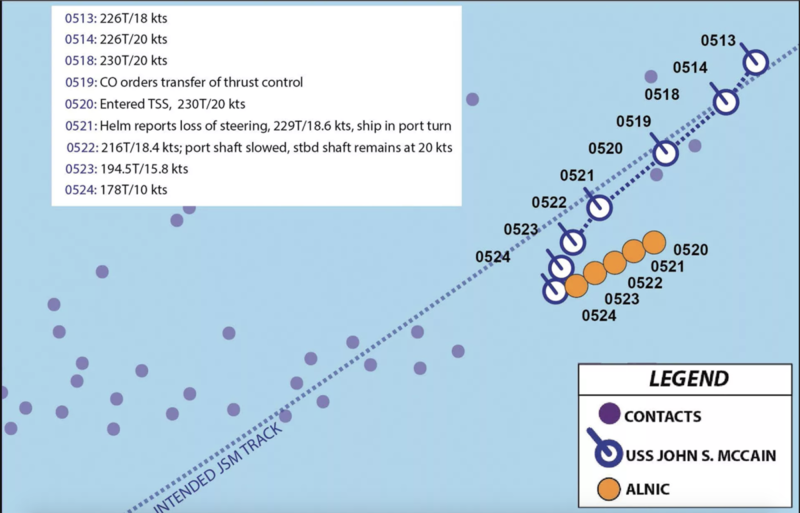 Although a second speed reduction was ordered by the skipper, and watchstanders ultimately managed to synchronize the throttles at the secondary station, nothing helped. 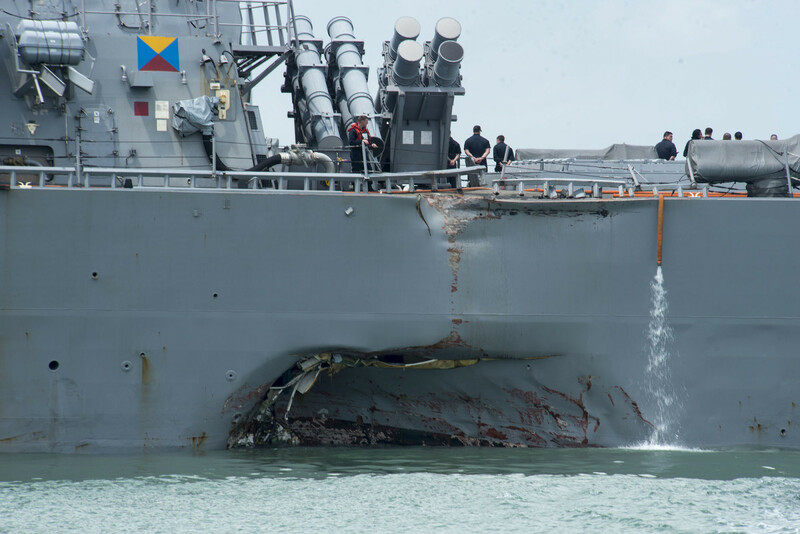 The McCain continued to turn to port, subsequently crossed in front of the ship she’d passed earlier, the M/V Alnic MC, and at 5:24 that morning, the Alnic slammed into the McCain’s port quarter. Berthing areas were immediately flooded and a total of 10 sailors lost their lives. In reality, the ship had never lost steering at all. It had only seemed that way. Court-martials were ordered, with criminal charges pending. 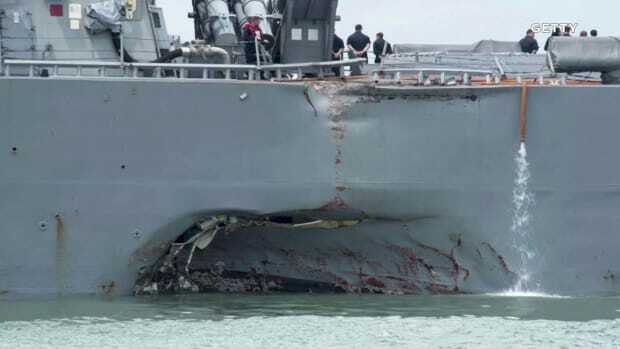 Results of the USS McCain’s seeming steering casualty were even more deadly. 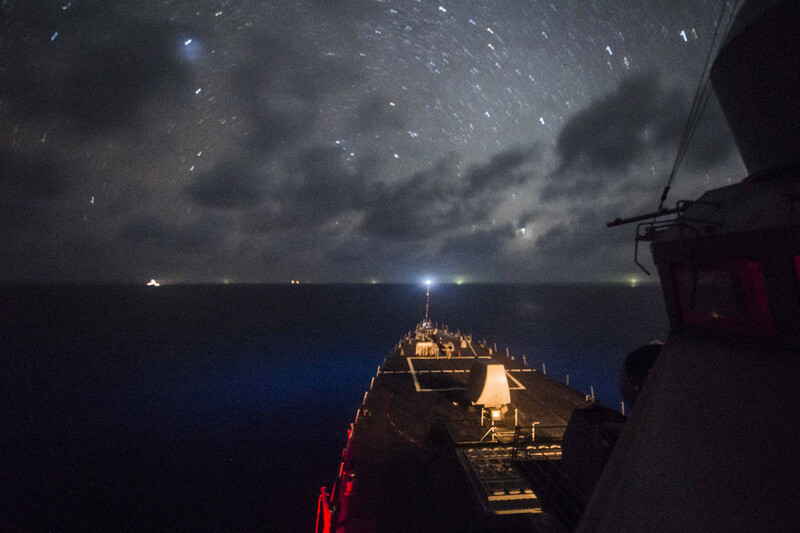 The USS Fitzgerald operating at night. 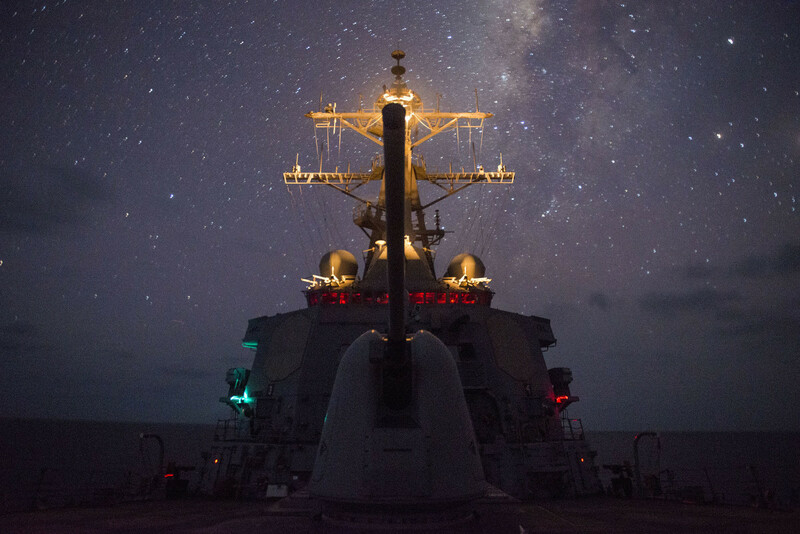 The mission of the USS Fitzgerald in the hours just after midnight on June 17, 2017 was simple enough: Transit a highly trafficked area known as the Sagami-Wan, just off the coast of mainland Japan, at comparatively high speed. Given the ship’s technological capabilities—she was a fast, gas-turbine-powered McCain-esque guided-missile destroyer carrying the latest in military-grade marine electronics in both her wheelhouse and her Combat Information Center (CIC)—the task was virtually custom-made. 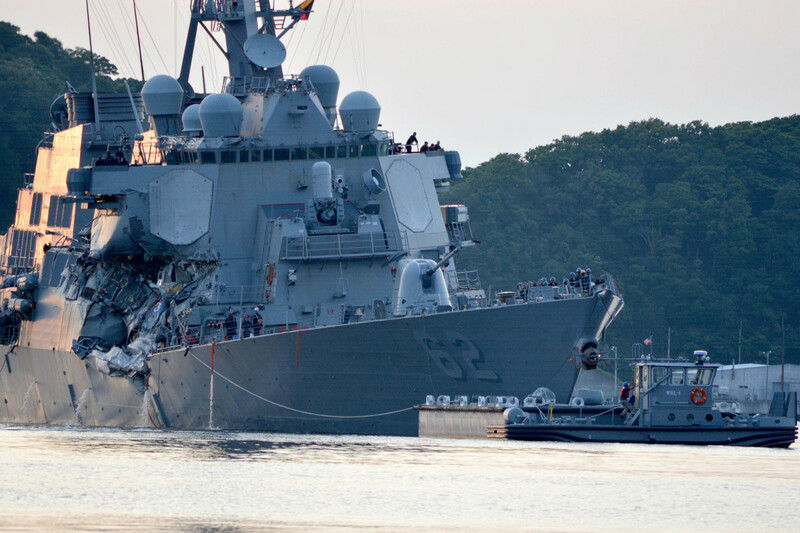 The USS Fitzgerald after colliding with the MV ACX Crystal. Nevertheless, things worked out—or seemed to at first. But soon an even more drastic complexity arose, seemingly out of nowhere. 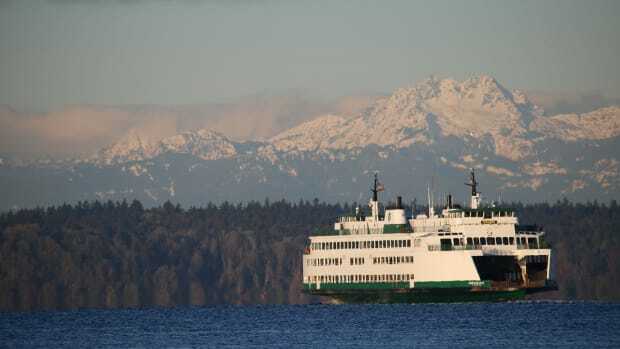 A junior watchstander reported seeing the lights of another of the three merchant ships—the M/V ACX Crystal—closing rapidly from the starboard side. 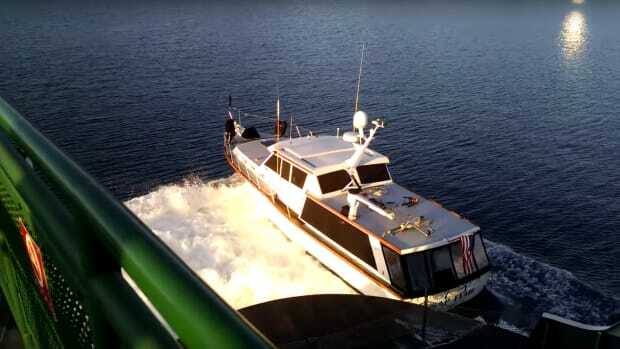 In response, the officer in charge apparently became confused, first ordering right full rudder to pass astern of the Crystal but then ordering full speed, then flank speed, as well as full-left and hard-left rudder. None of this was effective. At approximately 1:30 in the morning, the Crystal’s bulbous bow rammed the Fitzgerald amidships, doing significant damage both under and above her waterline. Again, several sailors sleeping or working belowdecks lost their lives. Ultimately, the toll turned out to be seven dead and three injured. And again court-martials were ordered, with criminal charges pending. Note the three merchant ships on the USS Fitzgerald’s starboard side just prior to the Fitzgerald’s deadly collision. 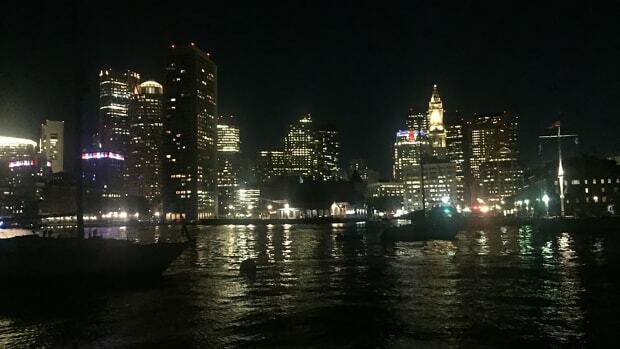 For three decades prior to 2003, the U.S. Navy sent all of its new officers, whatever their commissioning source, to The Surface Warfare Officer’s School (SWOS) in Newport, Rhode Island. There, the officers underwent extensive simulator training featuring a variety of military vessels and worked through numerous courses that emphasized the practicalities of navigation and seamanship. 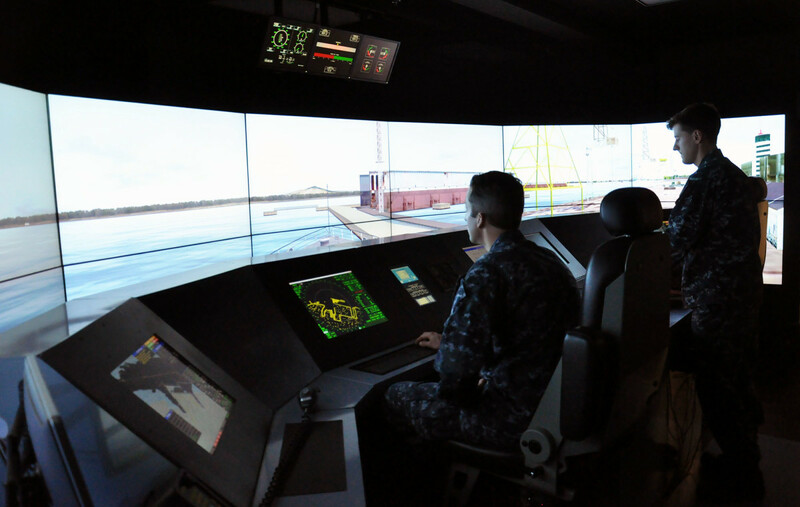 Students at Surface Warfare Officers School (SWOS) train on the Littoral Combat Ship (LCS) Full Mission Bridge (FMB) simulator. 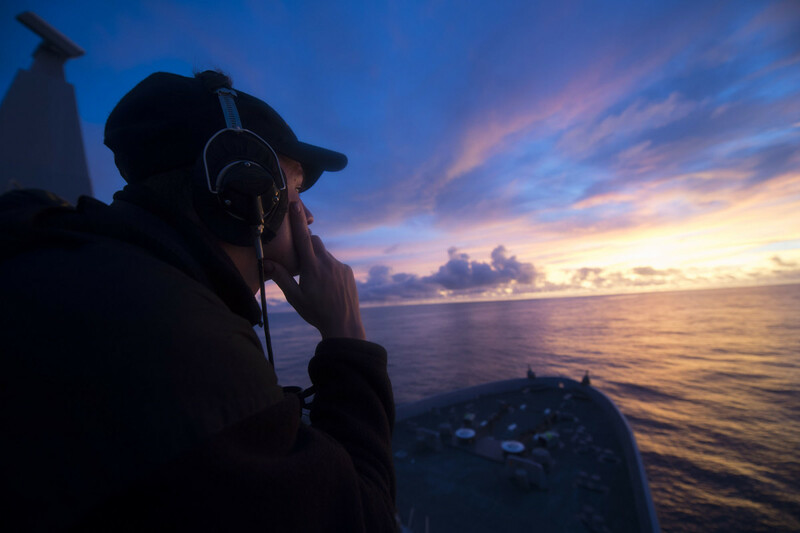 A Navy sailor standing watch at sunset. With the shuttering of SWOS in Newport, the Navy’s emphasis on training across the board began to falter and has continued to falter despite the launch of a new, albeit abridged SWOS program, in 2012. Or at least that’s the opinion of an acquaintance of Eyer’s, retired Navy commander Kirk Lippold, who was the skipper of the guided-missile destroyer USS Cole in 2000 when she was attacked in Yemen and 17 of her crew members were killed by al-Qaeda terrorists. A Multifaceted Fix? Or Not! More and better training is not all the Navy needs to address its problems in the coming months and years, according to Chief of Naval Operations Admiral John Richardson. Additional funding is also needed, along with extra manning to reduce the mounting pressures the Navy is currently struggling under, pressures that result in a lack of sleep for both officers and crew, the incremental but steady lowering of performance standards while smaller and smaller crews try to do more with less, and the unfortunate tendency to dodge onboard training-related activities in favor of mission-related activities that seem more critical at the time. Richardson has also suggested that going outside the Navy for additional assistance, perhaps of a technological nature, may be a good thing. During a press conference shortly after the McCain collision he told reporters he envisioned venturing beyond the Navy’s official footprint to bring in “industry experts” to help work through problems. The comment continues to frustrate many retired officers like Lippold. The point they make, often quite passionately, is that the Navy needs to again emphasize the fundamentals of seamanship and navigation when preparing new officers for sea duty, not muddy the waters with what they see as an ever-increasing reliance on contractor-supplied modern marine technology. 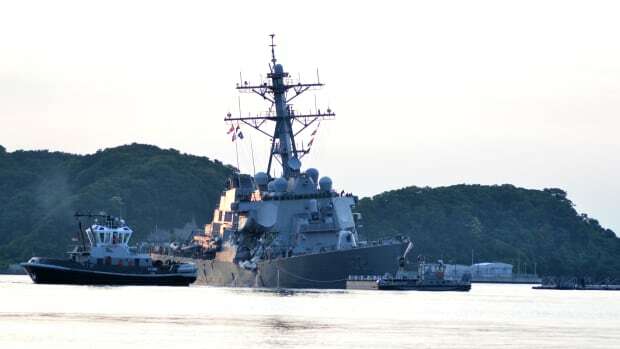 Poignantly, both the McCain and the Fitzgerald collisions took place in the early hours when darnkness prevailed but visibility was still good. Lippold wholeheartedly agrees. He is totally convinced that at the present time the U.S. Navy needs to reemphasize old-fashioned yet proven techniques, like the use of maneuvering boards, lookouts, strict adherence to the Rules of the Road and, “watchstanders who actually look out the bridge windows.” But he’s also less than hopeful that the Navy will genuinely address—or be able to genuinely address—the considerable training-related improvements he thinks must be made. Making big improvements, after all, typically means submitting big budgets. Study and be familiar with the so-called Rules of the Road. Keep a copy of the U.S. Coast Guard’s Navigation Rules International — Inland on board. It’s an easy-to-obtain book that contains and explicates the rules. 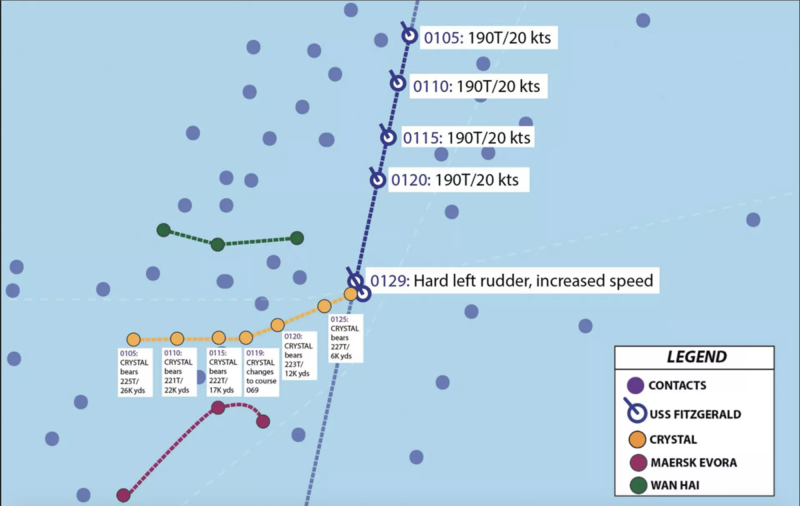 Use radar if there’s a unit on board your vessel—and know how to tune, make clutter adjustments, switch ranges, etc. Owning an expensive, highly sophisticated radar is no guarantee it will do you any good. Maintain your situational awareness by employing not only your eyes (and a pair of good binoculars) to periodically scan the horizon, but also your ears to keep tabs on engine-related and other mechanical issues. If possible, post a lookout or lookouts when underway. Use your VHF radio. 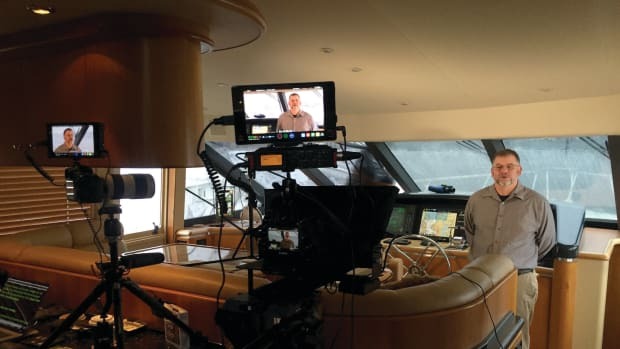 The best way to clearly understand and deal with crossing, overtaking, and meeting situations in open water is to work things out well in advance on your VHF. Transmit and receive AIS signatures whenever possible. Contacting other vessels via VHF is easy these days thanks to the fact that their names appear on your MFD via AIS. Be thoroughly conversant with on-board mechanicals and other equipment, especially the critical stuff. Whether we’re talking throttle and shift controls, steering, backup steering, running lights, fuel filters, sea strainers or whatever. There is nothing worse, should an emergency arise, than not knowing how to safely and efficiently operate what you’ve spent so much of your hard-earned money on.